The MillFast Probe Bypass Plug us used when you are using a PTS or Passive Probe and want to remove the probe or PTS and still have the mill operational without going into the settings screen. Simulates the Passive Probe in NON-TRIPPED mode. This is the standard plug used with all Tormach mills with Pin 5 sent to ground (pin 4). The ETS Probe Adapter lets you keep your Passive Probe (32309/32310) and either an Electronic Tool Setter "ETS" .. The DUAL Passive adapter lets you keep two passive devices like the Passive Probes (32309/32310) connected at .. 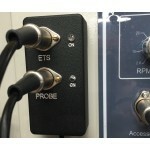 The PTS-Passive Probe Adapter-440 adapter lets you keep two passive devices like the Tormach Passive Probe (32309/3..